Specview is a tool for 1-D spectral visualization and analysis of astronomical spectrograms. It is written in Java thus can be run anywhere Java is supported. Specview is capable of reading all the Hubble Space Telescope spectral data formats, as well as data from several other instruments (such as IUE, FUSE, ISO, FORS and SDSS), preview spectra from MAST, and data from generic FITS and ASCII tables. It can also read data from Virtual Observatory servers, and read and write spectrogram data in Virtual Observatory SED format. It can also read files in the SPC Galactic format used in the chemistry field. 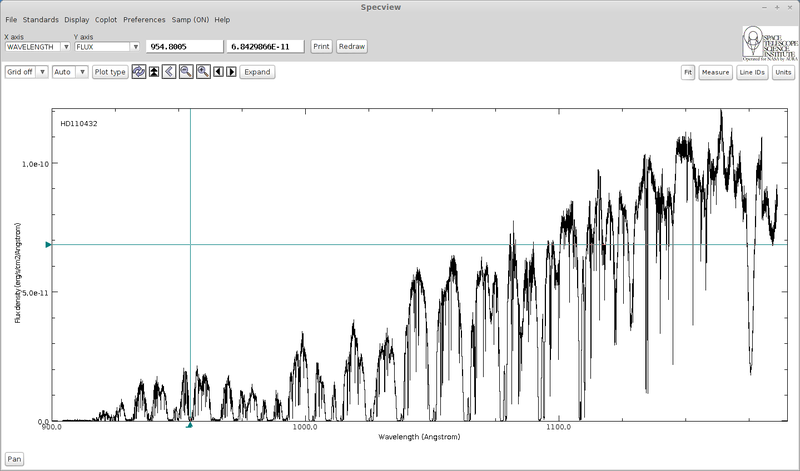 Specview can overplot spectral line identifications taken from a variety of line lists, including user-supplied lists. Its linelists’ query form has been modified to include the VAMDC Query Module, called QueryBuilder, thus providing the full capability of querying the VAMDC databases. In particular it allows to select finely the observed species and properties of linelists. Currently about 20 spectroscopic databases are inter-connected through VAMDC and accessible through VAMDC software and libraries. The tutorial or quick start on SPECVIEW allows users to pick up the tool easily. This tutorial describes in a simple way the various stages of functions in Specviewl accompanied each time by specific examples. You can also find in the document a user guide which contains more details. – Display quantum numbers informations for each level. – Convert wavenumber or frequency value into wavelength if wavelength is not available in transition data. – Enhancement in SAMP functionnalities. – Search interface now includes QueryBuilder API. – Possibility to select queried nodes. – First SPECVIEW release including VAMDC extension. – Search parameters are only minimum and maximum wavelength. SPECVIEW 2.17.6 Installer file for Linux/Unix. SPECVIEW 2.17.6 Installer file for Mac OS X.
SPECVIEW 2.17.6 Installer file for Windows.